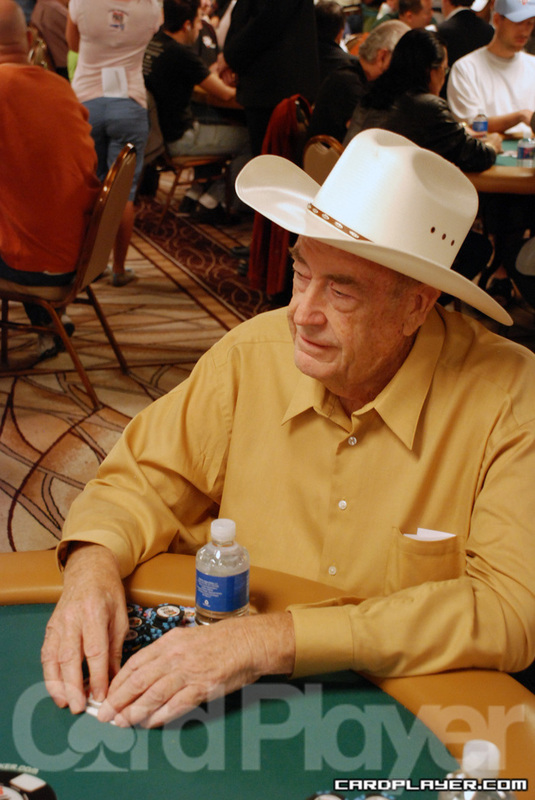 On a flop of 9 4 2 Doyle Brunson raised the small blind’s bet and the two went to the turn. The turn brought the Q , on which Brunson bet and the small blind called, and the river was the K , on which Dolly bet again and the small blind called. With four clubs out there it would’ve made since for Brunson to show a flush, but instead he flipped over K Q , for two pair. Apparently his opponent was club-less as well, mucking his hand. Brunson had 57,000 after the hand. Matusow was trailing and the flop brought no help, coming A A 5 . He needed a king or running cards, but the board bricked the rest of the way â€” 4 and 8 , and Matusow was eliminated. Painted had around 54,000 after the hand. On a flop of Q 4 3 , Daniel Idema bet and was called by Darren Woods. The turn was the 3 and Idema bet again. Woods called and left himself with just one 5,000 chip behind. When the 4 hit on the river, Idema bet again. “I missed,” said Woods with a chuckle as he tossed his cards into the muck. Idema finished the job the very next hand when Idema’s Q-10 toppled Woods’ 2-4. The river was already dealt and the board read K K 10 J 9 . David Chiu bet out and was raised by Kyle Ray. Chiu thought for a second before making the call and showed K Q , good for a straight, but Kyle Ray turned over the 9 9 , giving him a full house that he made on the river. Chiu fell to 150,000 and Ray climbed to just shy of the 700,000 mark. David Baker was crippled in a hand with Brock Parker which left him with just 75,000 after he folded to a river bet. A few hands later, Baker raised on the button and Matt Keikoan called from the big blind. The flop was K 6 4 and Keikoan check-raised a bet from Baker. Baker tanked for a minute before putting in the last of his chips and the cards were turned up. Baker had Q 10 and Keikoan showed the 10 4 , leaving Baker with just three outs. The turn was the 2 and the river was the 10 , giving the pot to Keikoan and sending Baker home with $32,614 in his pocket. The board read Q 6 5 2 on the turn and Anh Van Nguyen bet and got a call from Jameson Painter. The river was the A and Painter checked and Nguyen bet. Painter raised and that brought a sigh from Nguyen, who played with his last few chips before putting his last 34,000 into the middle. Nguyen showed the A Q , but Painter showed the K 10 , giving him the nut flush and the pot. With the elimination of Nguyen, who gets $32,614 for his 10th place finish, we are down to our final nine players and the final table will get started shortly. The remaining 77 players in event no. 12, ($1,500 Limit Hold’em) are now on their one-hour dinner break. Those survivors will have a lot to chew on as they ponder the possibility of a World Series of Poker in-the-money finish. With just 14 spots to go before the money, it appears that recent WSOP final tablist Jameson Painter is pacing the field. Other big stacks include Michael Miccio, Hope Williams, Ilya Sheyn and Terrence Chan. Card Player’s own Jeff Shulman was in the hunt with a sizable stack early on, but faltered down the stretch to bust just before the break. Coincidentally, his seat was immediately filled by fellow November Nine member Phil Ivey, who is a bit short stacked. Other notables still in contention include Ylon Schwartz, Sorel Mizzi, David Plastik, Jason Potter, Marco Traniello, Shawn Buchanan, Jonathan Tamayo, Anthony Rivera, Ben Lamb and Matt Keikoan. Those who do make the money will be guaranteed at least $2,742 for their efforts, but all no doubt have plans for the $189,870 first-place prize. Play will continue until ten levels have been played or the final table is reached, whichever comes first. Stay tuned to Card Player for an end of the day recap to see who takes their place at the final table. Jameson Painter found himself all in after the first draw against chip leader Raphael Zimmerman. Painter took two cards on the second draw while Zimmerman took one. Painter then took one card on the last draw while Zimmerman stood pat. Painter turned over A-7-4-3-2, no good against Zimmerman’s 10-7-6-4-3 and Painter was out. Rep Porter was all in on a flop of K 8 7 against Jameson Painter. Porter’s A 7 was well behind Painter’s A A and he was eliminated when the turn and river improved Painter to the nut flush. Marc Naalden raised from under the gun and Jameson Painter reraised from the cutoff. Naalden called and checked a flop of 10 7 6 . Painter bet, Naalden raised and Painter called all in with K Q . Naalden’s 10 8 was in the lead and it stayed that way when the turn and river fell A 9 .